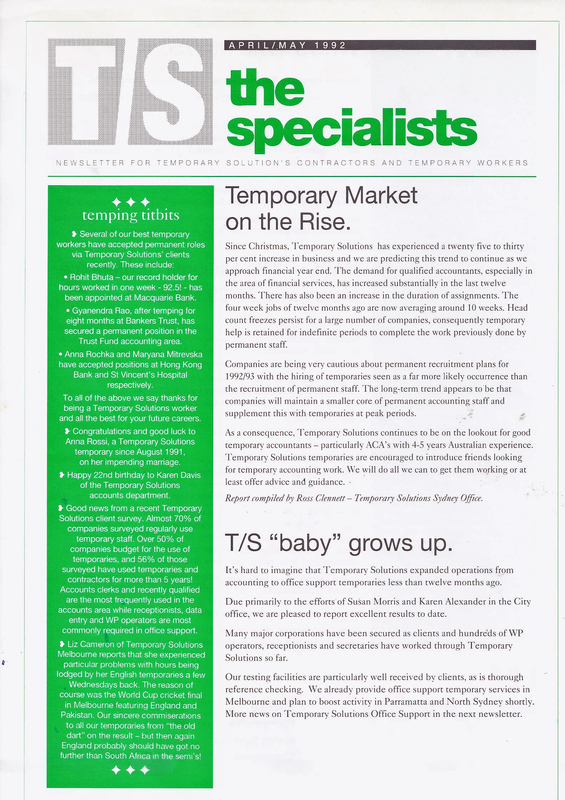 Twenty four years’ ago I was in my fourth month of employment at Temporary Solutions in Sydney. I was an accounting temp consultant. Unemployment (7.9%) was continuing to rise, eventually peaking at 11.2% in November 1992. The market was tough. Jobs were hard to come by and good candidates were plentiful. One of the few things I had in my favour was that I had focus. My job was very clear; I was responsible for generating, and filling, temporary accounting jobs in the Sydney CBD and the light-industrial corridor to the airport, comprising Alexandria, Waterloo, Zetland, Mascot. My target market was predominantly medium-sized companies that had an accounting team of five to fifty people. With no open jobs to fill, my day was spent calling and visiting prospects (you could count my clients on the fingers of one hand). As an accounting temp consultant I only had one person in each company I was interested in speaking to and meeting; the Financial Controller (or equivalent). The FC was the person who held the keys to any recruitment in his (rarely did I meet a woman FC in the early 1990s) department (no pesky internal recruiters in the ‘olden days’). I wasn’t seeking to uncover perm jobs or office support temp jobs or any other type of job. My own future depended on me focusing solely on the hunt for temporary accounting jobs to fill. This laser focus kept me my job. I didn’t really appreciate the incredible advantage this focus had given me until I read Focus by Al Ries (HarperBusiness, 1996). It’s a fantastic book, which the passage of time, and the massive commercial impact of the Internet, has only made more relevant. Here’s just a selection of the many Reis gems contained in the book, taken from Chapter 15: Fifteen Keys to a Long Term Focus. My temp accounting desk colleagues and I were out there selling temp accounting services. Nothing else. That made us memorable when most of our competitors had consultants covering both temp and perm or covering a range of temp roles. ‘A focus is powerful because it attracts exactly the right employees who can help reinforce a company’s strength. I took the job at Temporary Solutions because I was offered a job on the temporary accounting team, which I was assured was a big area of importance to the directors, compared to a more vague job offer at Accountancy Placements (now Hays). After a few months on the Temporary Solutions Sydney temp accounting desk I was clear that Bronwyn (my manager) and Michelle (senior consultant) were two of the best consultants in the whole company. I learned quickly simply by copying what they both did. The company also invested resources in ensuring that our focus as a specialist temporary business was consistently communicated to our target market (see newsletter below). ‘‘You need to have the courage to make a focusing decision and then wait for the market to react to your moves. It won’t happen overnight. In focusing a company, you start out by cutting back. In the short term the numbers might reflect this pruning process. Sometimes you have to take one step backward in order to take two steps forward. Instead of asking whether a given decision will improve the numbers, ask whether the decision will improve a company’s focus. 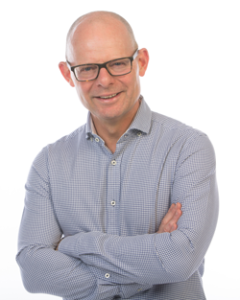 The three company directors, John MacSmith, Greg Savage and Graham Whelan, made a far-sighted decision to create a separate name for the temporary division of the company, Accountancy Careers Pty Ltd (later Recruitment Solutions Limited). In the late 1980s this was unheard of. All our competitors in the temporary accounting space operated under the same name for both perm and temp business. How well did this focus work? Well, here’s my month-by-month personal 1993/94 financial year result, three and a half years after I started a desk from scratch. Compare the very bottom right amount (my target) with the number to the immediate left (my result). Focus: It saved, and built, my recruitment career.